Byta - Blog "Announcing Byta's Mailchimp Integration"
When we talk to Byta’s different user groups, themes start to develop. For example, PRs all over the world express the same frustration. They feel it’s impossible to get music and information out to their contacts in a simple, efficient and consistent way, for each and every campaign. Generally, this is because they need to jump between multiple services to share music, depending on the level of security each label (or release) is working with. Worse still, some are forced to submit their contact lists to labels for direct delivery to media. We are specifically addressing this issue with our Forward (FWD) feature. Still, it’s easy to forget all this chaos impacts recipients most. Those in the media receive so much music from so many different sources, clicking through to multiple services is confusing, if not infuriating. So much so we’ve been told over and over it has a direct impact on recipients’ listening habits. We are committed to helping PRs win back control over how they work while giving recipients the same control over how they receive. Now it’s time to take that further. Now with Byta’s Mailchimp Integration senders only need Mailchimp for mailing lists and Byta for audio. The result is a consistently clean & simple user experience for recipients. Best part is the integration takes seconds to set up. Adding audio to your mailout is as simple as pasting a little code, as you would a Soundcloud embed or social links. 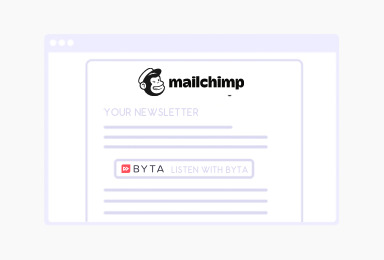 Read more on Mailchimp’s Byta Integration page or Byta – Mailchimp. For full instructions read our Mailchimp Integration article in Byta’s Knowledge Base. Already a user? Log in and add your Mailchimp API Key on your settings page to get started.